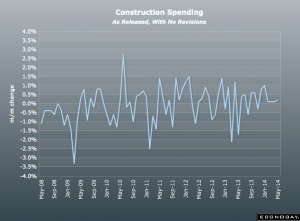 Released On 5/1/2014 – Construction spending in February edged up 0.1 percent, following a decline of 0.2 percent the month before. 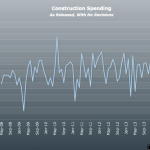 Strength was in private nonresidential outlays which rebounded 1.2 percent after a 1.0 decrease in January. Private residential outlays decreased 0.8 percent in February, following a 1.3 percent boost in January. 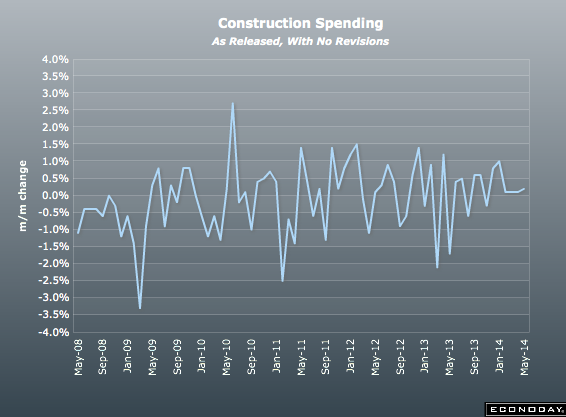 Public outlays nudged up 0.1 percent, following a drop of 1.3 percent in January. On a year-ago basis, total outlays were up 8.7 percent after a 9.4 percent boost the prior month.